HOW DID YOU GET TO BECOME AN EXPERT IN GROWTH HACKING? I was in marketing back when it was really simple – you only have a few channels to choose from like e-mail, PPC or maybe some display advertising. I actually started in college getting some part-time work with small companies with very small budgets, doing up-work. I started off in SEO around fourteen years ago, Neil Patel got me into it by telling me about SEO. Over time SEO got more difficult, so I had to learn that prioritizing marketing approaches requires a strong knowledge of your product, and to know what the development team are doing. All of this thinking made me become a T-Shaped Marketer and look outside of SEO and figure out how to convert traffic into growth. WHAT AREAS OF GROWTH HACKING ARE YOU MOST PASSIONATE ABOUT? First and foremost is Content Marketing and education through content. I advocate being very open with the end user. Product marketing is also super important – I really believe the product is the marketing vessel which you can get to fully contributed to the marketing process. If you check out some apps and games like Candy Crush: by adding a bio component where users have to invite their friends for more credits, Candy Crush drives users to tell their friends about the product – to the point where I had to block my mom on Facebook because she was sending so many invites! I have used this approach for my company Mailshake, which was probably one of the last of many tools used for cold emails in the sales process, but we managed to use this to our advantage. We looked at every one of our competitors and what their customers were saying in their reviews of the products and found that a main complaint was how complicated the software was as it made it far too difficult to use. So we built a product which was super simple and easy to use and that became our marketing channel. With the product doing the heavy lifting for marketing, our biggest channel for growth became word of mouth. Last but not least, the single most important thing if you are a B2B company or even a software platform is activation. Getting people through the “a-ha” process or the sticky points, especially as a new product category you’re going to need this “a-ha” moment within the first moments of customers discovering and signing up for the product. WHICH GROWTH HACKING INFLUENCERS INFLUENCE YOU? Hiten Shah – the co-founder of KISS Metrics. He’s a product guy and also a marketer, and has done a great job of both “talking the talk” and “walking the walk”. He’s become an unofficial mentor for me, when I go to him with a problem he gets me to come back to him with an email, but I can’t figure out how to articulate it properly. Then he points out to me that’s where my real problem is: I don’t even know my problem well enough to say it in a sentence or two. Then when I figured out the problem enough to articulate it, I ended up solving it. Sam Hewlick – User On Board. Sam is really good at user onboarding, I’ve learnt a lot from him. Ty Magnin – Director of Marketing at AppCues. Their blog is phenomenal on user onboarding. Within content marketing, it’s a tie between Neil Patel and Rand Fishkin: both different personalities and styles, but I am a huge fan and I still learn so much from their content. And they’ve been doing it for so long it’s so impressive how they’ve managed to still come up with topics and still be the cutting edge in an environment where they are competing with many new players. OUTSIDE OF GROWTH HACKING WHO ELSE INFLUENCES YOU ? Tim Ferriss – since his book ‘The Four Hour Work Week‘ I’ve been a fan. He’s been clever with his investments in companies like Uber and continued to build up good relationships with his own mentors, so isn’t just known for his books he’s continued to develop himself. Gary Vaynerchuk has been so impressive by starting out with Wine Library with only a few people viewing his videos and being a dorky wine connoisseur to getting things like celebrity shoe deals. I think it’s pretty interesting and I know they are kind of cliches but I learn from all kinds of people. Finally a group I find influential are sportspeople and athletes because, for example, Basketball players will play an hour or two game but also be doing 10 hours practice per day which I think is really great and influential. WHICH BRANDS OR PRODUCTS STAND OUT FOR YOU IN GROWTH HACKING? I like what Drift are doing as a cut-communications, marketing automation platform. They’re very open in talking brand and building up the brand which is great to see in a software company. Also I like Price Intelligently – they built up from an agency doing pricing consulting to having a SaaS product ‘Profit Well’. Why I love their brand though is I’ve always been on the agency or consultant side of marketing, and Price Intelligently is around 3 years ahead of my own company Prophetess so it’s great to see the potential of keeping an agency model. Finally I think Under Armour have done super well coming in late to the market where companies like Nike and Adidas were dominating the market, but they’ve done some interesting things like buying tech companies like My Fitness Pal. They’ve got the continuity from the technology built into their products, so I go in using My Fitness Pal and went on to buy a pair of Under Armour shorts so they end up advertising to me without actually advertising to me. I’ve worked with Hubspot before, where we’ve done a core concept marketing working course together. I went to help a lot with their workshops specifically around content promotion. So if a brand wanted to work with me I would be keen to do webinars or simply drafting a blog post together, or doing a joint podcast – I’m happy to work with brands who I believe are doing something different. 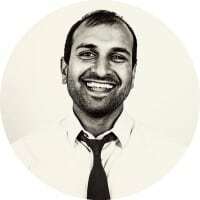 The best way would be through my website sujanpatel.com on the contact form on the very bottom – it goes straight to me.